"Your Feeling Gets the Blessing!" In this teaching you come to realize that: If you wish to have the good that you desire – to get what you want – you must make yourself FEEL that you are the one who deserves the good that you desire to be, to do and to have. You must make yourself FEEL like you ARE ALREADY the one you wish to be, whatever you wish to be! Based on The Bible Story of Esau and Jacob… But It's NOT What you Think! In the story of Genesis, Jacob and Esau are twin sons of Isaac and Rebecca. The younger son, Jacob, plays a trick on the blind father, Isaac, by making himself FEEL like Esau, the oldest son, to the blind father’s touch, and thus the blind father gives Jacob the blessing of preeminence, of Lordship, instead of Esau. 6 Lessons of Esoteric (Inner Meaning) Interpretation that Will Drive This Truth Deep Into Your Consciousness! As you may know by now, Rev. Ike doesn't interpret the Bible literally. Rather, he interprets the Bible as a book of Spiritual Psychology – a book that is about YOU – a book in which every character represents some facet of YOU! Why Rev. Ike takes nearly 6 Hours To Teach This Life-Changing Lesson! … all leading to the one truth: Your Feeling Gets the Blessing! He has divided this teaching into six lessons, each lesson interpreting the Bible story from a slightly different viewpoint, each lesson emphasizing different symbolic meanings within the story. And in parts of each lesson, he is purposely redundant to enable you to fully understand and absorb the profound meaning of this lesson into your consciousness! You will participate in each lesson as you repeat empowering affirmations with Rev. Ike, conditioning your mind with these powerful truths. This profound, eye-opening teaching is perfect for those of you who have some experience with Rev. 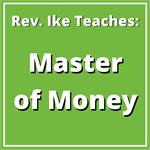 Ike's teachings – who have already studied at least one or two of his other lessons! What You Will Learn From This 6-Lesson Teaching! All six lessons are delivered in Rev. 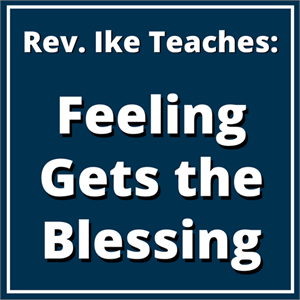 Ike's dynamic and entertaining style – with his usual wit and humor, with illustrative examples, interactive affirmations, and techniques to help you get the "right feeling!" Lesson #1: "How to Be a Smooth Operator and Get What You Want" Rev. Ike lays the groundwork, introduces the Bible story, and explains the symbolism of Esau and Jacob (that these are both facets of YOU!) You learn the importance of Feeling in order to get what you want. "Feeling is above Fact!" And you learn how you must define yourself – assume the identity of the person you wish to be. Lesson #2: "The Changeless Law" Rev. Ike goes into great detail, teaching you how to be careful with your feeling nature, because the Law is: "Your heart always gets what it feels." You learn why it is important to "clothe" yourself with the right feelings, the feelings of the person you wish to be, and why you must constantly work to bring your mind back from the material world to your spiritual self. You repeat affirmations with Rev. Ike that put you in contact with your spiritual self, your all-knowing God-self! Lesson #3: "How to Change Things and Solve Problems" Rev. Ike teaches you how to go from one 'state' of consciousness to another. You learn how to change a problem or a condition in your life (represented by Esau) that you don't want into a positive solution (represented by Jacob) by taking your feelings away from the problem and putting your feelings onto the solution! You discover how to express a new idea of yourself! Lesson #4: "Your Twin Nature (Animal and Spiritual)" You learn how to reconcile your animal nature (represented by Esau) with your Spiritual nature (represented by Jacob), how to control your animal emotions of anger and irritation, how to move from a state of body consciousness into a state of Spiritual consciousness in order to dwell in the feeling of being, doing and having the good that you desire, and how to use the "mental equivalent" to get what you want. Lesson #5: "How to Be a Successful Master Person" As a Master Person you come to know yourself, to be aware of the spiritual aspect, the Divine aspect of your nature. You will learn how to achieve the delicate balance between controlling your body and being controlled by your body. Rev. Ike gives you rules for handling your mind, for making your Divine Mind lord of your body, in order to get your good desires. You learn that your birthright is your power to bring forth a new preferred condition in place of an old condition that you don't want. Lesson #6: "What is your Gut Level Belief and Feeling about Yourself!" In this final lesson, Rev. Ike sums up the previous lessons and hits home with some more practical applications and advice. You learn how to use your feeling nature with the Law of "I AM" – how to use the technique of visualization to become that, which in fact, you are not, how you must talk to yourself, and why you must work on your thinking and feeling every day. And you learn to trust the Source of All Good – the Father – that is within you! 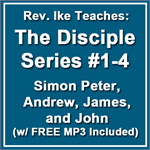 This 6-lesson set is a powerful teaching that is so rich with meaning and symbolism, that it may take you a few listens before you completely absorb it. But when you do, WOW!